How Long Does it Take to Build with Earthbags? Lots of readers ask how long it takes to build with earthbags. Well, that’s difficult to answer because the strength of workers varies and every job is different. But it’s good to have an approximate figure to work with for planning purposes. 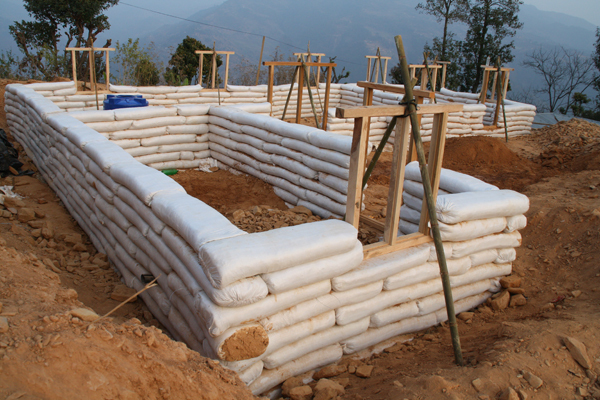 The following calculations show how long it took to build the first 5’ of walls on the training center in Nepal. They had a mix of strong and average workers which helps make this example more realistic. Wall height will vary so the calculations are for square feet of wall surface. Interior and exterior walls are included in this example. Wall length was determined by measuring the length of outside walls and the length of the interior wall. We’ll assume 8 hour days, and assume students work half as hard as strong workers, so use 5.5 students instead of 11. For ease of calculations, do not deduce for windows and doors. 6. Square feet of wall surface: 195’x 5’ = 975 sq. ft. There have been many successful earthbag buildings completed in Australia. You can find much more information about this at http://www.earthbagbuilding.com. Simply put, it takes a long time. Unless you have a lot of free labor, it is also not real cost effective. Digging the footing alone can take time and be much work. Especially if it is rocky and you have no heavy equipment. My experience has shown that with most alternative or natural building methods, time equals money. The money you save on building materials costs you in time. If you need a shelter in a hurry, even small earthbag shelters may take too long if your working by yourself. You maybe better off buying an RV for the duration of the build. Compare the time it takes to build the above wall out of earthbags to the same time it would take 2 skilled carpenters to build the same wall out of lumber. Both would be standing, both need footings and both would need exterior covering. The time saved in building would cost you in lumber,nails and carpenter wages. There’s some truth to that. Just realize lots of people can’t afford to hire skilled carpenters and buy lots of factory made materials. In other words, they have more time than money. There are other advantages to building with natural materials: joy of designing and building your own home just the way you want it; curves versus squares; aesthetics; acoustics; hurricane resistance; earthquake resistance; bullet resistance; thermal mass; insulation; non-toxic; far greater fire resistance… So there’s a BIG difference. In general, one is uplifting and beautiful, the other is wasteful and deadening. In total agreement with you. It’s just that sometimes people don’t have a few years to build a house. They may need shelter asap. Everything in life is a tradeoff and so it is with most alternative building. I just think readers should be informed that earthbag building takes not only a huge amount of physical labor, but they need to plan on a realistic time table. While ferro cement/concrete isn’t green, small birdcage domes could be completed by one-two people in much less time then a comparable sized earthbag one. It would be a much more doable project for a single person in desperate need of shelter. The time factor is probably one of the largest hindrances for earthbag and many other natural building systems from becoming more mainstream. Developers are often paying interest on building projects. The longer it takes for completion, the more it costs them. That is why the mechanical auger system James from United Earth Builders posted about maybe a great turning point. That said, I am getting ready to start my earthbag pump shed. It will be a small 10×10 ft gable building. If it goes as scheduled LoL, I will send in some pics. We’ve made some blog posts on living in RVs for temporary shelter as you build your main home, and many other stories about tiny homes, temporary shelters, yurts, you name it. We try to cover all relevant topics. If you have limited strength and/or can’t get help then use lightweight building systems such as strawbale, wattle and daub, lightweight earthbags such as scoria, ferrocement, etc. One person holds the bag and one or more other people dump in buckets of soil. My YouTube channel shows short videos of every step. I’ll add this to our FAQ page if there are no corrections. Another factor is the soil did not need to be mixed with cement or anything else..and very close to the work area..until we began to use it up and had to use the doors only..
We tried to have 2 teams filling at once..which really helped in production and set realistic goals for each day.. But finish the walls in about 2 weeks is pretty good ..only one rain out day.. And it was Cold..